Mission: To enable the people of Grand Island to encounter Jesus by sharing Word and Sacrament with a loving concern for one another. Help: Promote and support our church and promote and support the events that we sponsor! Strengths: A strong, stable, faith filled community that has open arms for all who enter through our doors. St. Stephen's Church, 2100 Baseline Road, Grand Island, NY is holding its 3rd Annual Three on Three Outdoor Basketball Tournament on Saturday, July 14, 2007 at 9 a.m. (player check-in 8:30 a.m.). This event takes place at St. Stephen's Church grounds parking lot, 2100 Baseline Road, Grand Island, NY and is professionally run by Henshaw Hoops. The Entry Fee is $70.00 per team and teams MUST PRE-REGISTER by Friday, July 13, 2007. ! Early Bird by JULY 1, 2007 PAY ONLY $60.00 PER TEAM - - - That’s HUGE Savings!! For registration forms, download now by clicking "St. Stephen's Hoopla"
St. Stephen's Church, 2100 Baseline Road, Grand Island, NY will host an incredible journey into "The Footprints of God" beginning with Moses: Signs, Sacraments And Salvation. This Bible study will be held on Wednesday evenings, January 10 and 24th at St. Stephen's Church Community Room (Library) from 7 p.m. to 9 p.m. Join in this DVD adventure as Steve Ray, best-selling author and popular Bible teacher, takes you on an incredible journey of discovery through Egypt, Jordan, and Israel. Cross the Red Sea, wander the wilderness and climb Mt. Sinai. Together you'll discover how Moses, the Exodus, and the Hebrew experience in the wilderness beautifully point to the coming of Christ and our salvation. Retrace the Christian faith. Gain a deeper appreciation of our Savior, and of the Church and her Sacraments. All this in a fast-paced, entertaining biography, travel documentary, Bible study apologetics course, and Church history study, all rolled into one remarkable adventure! A comprehensive study guide is included. Cost $1. Call the parish rectory, 773-7647, to register. The St. Stephen Church Respect Life Committee sponsored a poster contest to promote awareness of the precious gift of life. Parish children put a great deal of thought and effort into their designs, which were displayed in the church narthex. The participants included Stephanie Neville. 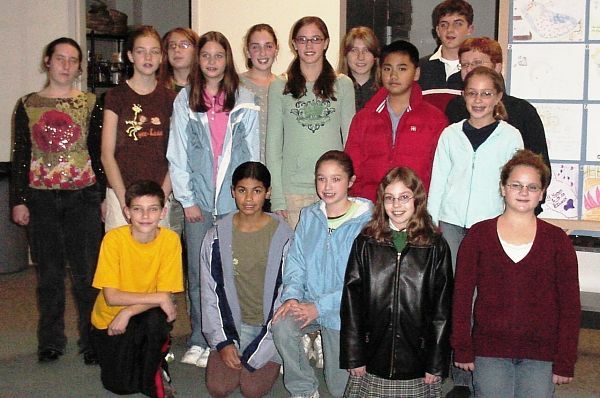 Justin Lazatin, James Bobak, Amanda Bruno, Erin McConnaghy, Jay Corrao, Kevin Gibas, Alyssa Pizzuti, Zaida Smith, Heather Smith, Jeremy Lazatin, Katie Turner, Shannon McDonough, Becky Masse, Sarah Ramsperger, Emily Sommer, Catherine Sponn, Brian Bobak, Emily Wynne, Shannon Doctor, Kaitlyn Holt, Katherine Studley, Kayleigh Weslak, Tom Bass and Justin Frentzel. Parishioners of St. Stephen's R. C. Church will present a Fall Festival on Saturday, September 30, 2006 on the grounds around the school and in front of the church, 2100 Baseline Road. The all day event, starting at 9 a.m. and ending at 7 p.m., will feature a Huge Farmers Market, Basket Raffle, Bike Raffle, Bake Sale, Costume Parade & Contest, Pumpkin Decorating Contest, Haunted House, Children's games, Chili, Chicken Chowder and Salad Bar Buffet. The full day of fun is open to everyone. St. Stephen's Golf Challenge, in its 8th year, will be held Monday, October 2, 2006 at River Oaks Country Club, Whitehaven Road. The day begins with registration, lunch and driving range at 10:30 a.m.; a Shotgun Start, On Course Contests and Courtesy Cart at noon; a cocktail reception at 5:30 p.m. and a banquet, awards ceremony and auction at 6:30 p.m.
For complete information, click St. Stephen's Golf Challenge. Father Joseph F. Moreno, a Chaplain assigned to Search and Rescue Team 1 for two years at Ground Zero, will celebrate mass and share his personal experiences at 7 p.m. September 11, 2006 in St. Stephen's Church, 2100 Baseline Road, Grand Island, NY. An honor guard of volunteer firemen from Grand Island will participate in this service. Hopefully the memories of that tragic day will bring many throughout Western New York to St. Stephen's to pray for those most affected by 9/11 and for our country. Parishioners of St. Stephen’s Church, 2100 Baseline Road, Grand Island, are offering a limited amount of available space for their Rummage/Craft Show schedule for 8 a.m. to 2:30 p.m. Saturday, August 19, 2006 at the church. Call the Rectory at 773-7647 to reserve your space today! The next scheduled 'Hour Of Power,' Hawaiian style, hosted by St. Stephen's Church, will begin with a picnic at the pavilion at 5 p.m. Wednesday, June 28, 2006 and feature food, beverage and desserts for the entire family and games for the kids. (The picnic will move indoors to the Hospitality Room in event of inclement weather) Bring a blanket or lawn chair and a handful of your favorite munchies to add to our trail mix! Worship and praise, including all children, will be held in the main church, 7 p.m. to approximately 8 p.m., following the picnic. "And then, stay after and enjoy our special snack!" St. Stephen's Church, Grand Island hosts a support group for men and women who have experienced the death of a loved one. The group will meet from 7:30 p.m. – 9 p.m. Wednesday, June 14, 2006 in the Church Library. This week's topic is "Good Grief." Those who have lost a loved one are always welcome. Call Judy Polizzi, 773 4672, Shirley Lord, 773 4550 or Chuck Allaire, 773 5871 for further information. St. Stephen's Church, 2100 Baseline Road, Grand Island, NY will host its last of a series of Footprints Of God, 7:30 p.m. Monday May 8 in the Daily Mass Chapel. It is entitled Mary: The Mother of God. In this presentation participants will follow Mary's extraordinary journey on location in Israel, Turkey, and Greece with popular Catholic author and speaker Steve Ray, as a guide. Travel the dusty paths that took Mary to the heart of the salvation story. Discovering Mary will help one to know and love her Son. Attendees will clearly understand Mary's Immaculate Conception, her role on intercessor, her Assumption into heaven and more. A high-impact adventure that's a travel documentary, biography, Bible study, apologetics course, and Church history all rolled into one! What a way to celebrate Mary's month of May! St. Stephen's Church, 2100 Baseline Road, Grand Island, NY is holding its 2nd Annual Three on Three Outdoor Basketball Tournament on Saturday, July 15, 2006. "Last year we had over 40 teams entered in this event. This year's event will be bigger and better!" a spokesman for the event said this week. This event is professionally run and pre-registration is required (registration open to the first 80 teams). There will be NO DAY OF Registrations permitted. The Entry Fee is $70.00 per team and is due at time of registration. "If you have four players on your team that is only $17.50 per player." For registration forms, call the rectory at 773-7647, ext. 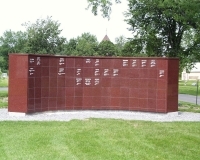 104 or you can download now by clicking "St. Stephen's Hoopla"
St. Stephens Church, Grand Island hosts a support group for men and women that have experienced the death of a loved one. Our group meets the second Wednesday of every month. We meet from 7 p.m. – 9 p.m. It is so important to be able to share your feelings of loss with others who understand fully the same feelings. Each month we will try to talk about a new area of getting through our grief. The loneliness, the need to talk about our loved one, the anger, the guilt, the frustration and our faith. Sometimes we feel as though we are walking through a fog and have a lack of direction. We share on the difficulty of beginning again or having a new direction in our life. Grief has no limits and each of us gets through it at our own pace. We experience feelings that are not right or wrong, they just are! We will meet April 12th to share some insights on Spirituality and Prayer. Sharing helps all of us walk through this difficult time in our life. If you would like to attend or need more information please call Judy Polizzi at 773 4672, Shirley Lord at 773 4550 or Chuck Allaire at 773 5871. Committee members shown from left are Sue Robinson, Mary Merritt, Maria Schory, Don Merritt, Fr. Nogaro, Jo Ann Linenfelser, Dan Linenfelser. March 22, 2006 . . .Arry Green from the Msgr. Carr Institute, recently spoke at all the masses at St. Stephens Church about the upcoming Catholic Charities Drive. According to Ms. Green, Catholic Charities last year gave assistance to over 183,000 people of all denominations in the eight counties of Western New York which is about 1 in 9 people in that area. Ms. Green pointed out that Catholic Charities is equipped to give many different kinds of aid to the needy from before birth to after death. She thanked the people of Grand Island for their past generous support and said that last year's total was almost $172,000 to the Fund. The theme for this year's drive is "One for all," the Diocesan goal is $10,900,000, and it runs from April 2-9. Contributions may be made at weekend masses or by contacting the rectory at 773 7647. St. Stephen's Church, Grand Island hosts a support group for men and women who have experienced the death of a loved one. The group meets from 7 p.m. to 9 p.m. on the second Wednesday of every month in the Hospitality Room of the Main Church. The next meeting is scheduled for March 8, 2006 to share on “If I feel Anger or Resentment, what can I do?” Those interested in attending, needing a ride, or needing more information may call Judy Polizzi at 773-4672, Shirley Lord at 773-4550, or Chuck Allaire at 773-5871. "Please join us, sharing helps all of us." St. Stephen's Church, 2100 Baseline Road, continues the series The Footprints of God - "Peter: Keeper of the Keys," an amazing journey of adventure about Peter, the rugged fisherman Jesus chose to lead His Church. 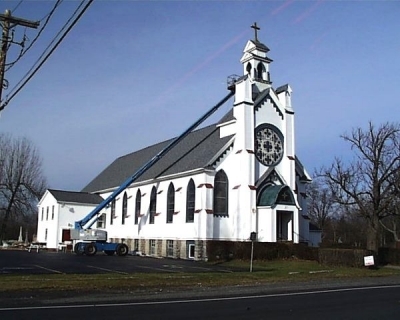 The presentation takes place from 7:30-9:30 p.m. Monday, March 13, 2006 at St. Stephen's Church. Filmed on location in Rome and the Holy Land, participants will follow Peter from Galilee to Rome to discover answers about the major role of the papacy in the saga of Salvation. The presentation is free and all are welcome. The next scheduled 'Hour Of Power' will be held at St. Stephen's Church, Baseline Road from 7-8 p.m. on Wednesday, February 22, 2006. For more information on the Hour of Power, click on Hour of Power at www.ststephenswny.com. Prayer requests, held in confidentiality, may also be made through this site. St. Stephen’s Music Ministry will lead the next scheduled 'Hour Of Power' from 7-8 p.m. on Wednesday, January 25, 2006. The focus will be "Patience." Hour Of Power, an hour of songs of praise and worship to our Lord, is held in the Daily Chapel at St. Stephen's Church, Baseline Road. The Hour of Power is geared to all ages, and families are especially encouraged to participate. Personal prayer is available upon request. Refreshments follow. A Grief Support Group Meeting will be held in St. Stephen's Church Hospitality Room from 7-9 p.m. Wednesday, January 11, 2006. This month's topic is: "Loss - The Change it Creates in My Life. Where do I Start?" Any adult experiencing the death of a loved one is welcome to join the group. For more information, call Judy at 773-4672. All are welcome to St. Stephen’s Church, 2100 Baseline Road, the last Wednesday of every month to celebrate our Lord, Jesus Christ through worship and praise at the Hour of Power, held from 7 to 8 p.m. in the Daily Chapel, with refreshments afterwards. The next scheduled date is Wednesday, December 28, 2005. For further information click "Hour Of Power." St. Stephen's Church, Grand Island, hosts a support group for men and women who have experienced the death of a loved one. The group meets from 7-9 p.m. on the second Wednesday of every month in the Hospitality Room in the new church, 2100 Baseline Road. "It is so important to be able to share your feelings of loss with others who understand fully the same feelings," a spokesman for the group said this week. "Each month we will try to talk about a new area of getting through our grief. The loneliness, the need to talk about our loved one, the anger, the guilt, the frustration and our faith," she said. "Sometimes we feel as though we are walking through a fog and have a lack of direction. We share on the difficulty of beginning again or having a new direction in our life," she said. "Grief has no limits and each of us gets through it at our own pace. We experience feelings that are not right or wrong, they just are!" The next Grief Support Group meeting is scheduled for 7 p.m. Wednesday, December 14, 2005. The topic will be sharing some insights on the difficulties of getting through the holidays Those planning to attend or in need of more information are asked to call Judy Polizzi at 773-4672, Shirley Lord at 773-4550 or Chuck Allaire at 773-5871. All are welcome to St. Stephen’s Church, 2100 Baseline Road, the last Wednesday of every month to celebrate our Lord, Jesus Christ through worship and praise at the Hour of Power, held from 7 to 8 p.m. in the Daily Chapel, with refreshments afterwards. Come enjoy warm, friendly fellowship as the Folk Group leads the assembly through song and prayer. Come sing, clap your hands, or sit quietly and reflect. Come enjoy the children as they offer their own interpretations through song, music and skits. All children are invited to participate. Personal prayer is offered upon request at the end of the evening. The next Hour of Power is scheduled for Wednesday, December 28, 2005. Visit the Hour of Power Website at "www.gihop.com", and then come and see. A "Blessing of Animals" will take place at St. Stephen's Church grounds, 2100 Baseline Road, at 12:15 p.m. Sunday, October 2, 2005. All Islanders are welcome to attend and bring their pets, large or small, to be blessed. This blessing, which will take place rain or shine, is in conjunction with the Feast of St. Francis of Assisi, patron Saint of animals and the environment. "Come and join your friends and neighbors on this once a year special happening for pets," a St. Stephen's spokesman said this week. St. Stephen's Church, 2100 Baseline Road, Grand Island, NY will host its HOOPLA 2005, a Professionally Run Outdoor, Double Elimination, Three on Three Basketball Tournament. Open to boys and girls, Men and women, in many age brackets, the HOOPLA 2005 is being held on Saturday, August 27, 2005. Registration begins at 8 a.m. Games begin at 9 a.m. Pre-register made by August 13, 2005 will cost $60.00 per team. Limited spots may be available the day of event for $75.00 per team. Registration fee includes a Hoopla T-shirt for each player, guarantee of two games, and trophies for each team member of the first place team in each bracket. Concessions will be available. Spectators are welcome! For registration application, call 773-7647 ext 104 or stop by the Rectory from 8 a.m. to 4 p.m., Monday through Friday. Scroll up for information on the Super Cash Raffle taking place after the HOOPLA. Mary Lou Ardino, outreach caseworker with the Monsignor Carr Institute, spoke about the upcoming Catholic Charities Drive during all masses at St. Stephen's Church last weekend. Ms. Ardino described the work that she does with people with emotional and behavioral problems. She said that Catholic Charities gives aid of some kind to 1 in 10 people in the eight counties of Western New York, and that $.93 of every $1.00 goes to aid with only $.07 for administration. She thanked the people of Grand Island for their generous support in the past and encouraged those who could to increase their donation if possible. This year's drive runs from March 13-20. The Diocesan goal is $10,700,000, the theme is "We are a community of hope," and the patron is Mother Teresa. Contributions can be made at weekend masses or by contacting the rectory at 773 7647. A Christian Contemporary musician, P.W. Gopal, will perform at 7 p.m. Saturday, January 15, 2005 in St. Stephen's Catholic Church, 2100 Baseline Road. Admission is free and Gopal will be available after the performance. Copies of his CD will be available for purchase. For more information call 773-9044. Jodi Robinson took these photos today (12/2/04) and the one on the far right was taken in 1933. Click photos for larger view. The landmark Old St. Stephen's Church, built in 1890 on Baseline Road and enlarged in 1948, has been given a nice new look over the past month with siding completed and color added. 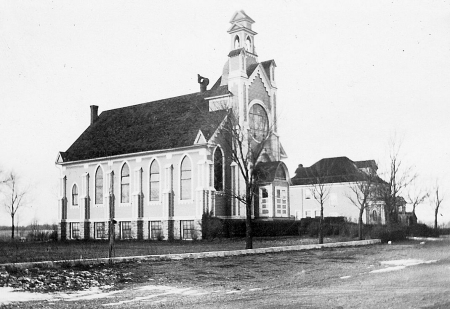 The "rectory," shown in the photo on the right and built in 1906, was torn down about 10 years ago. A Christmas play, Faces of Christmas, will be presented at 7:30 p.m. Saturday, December 11 in the new St. Stephen's Church, 2100 Baseline Road. The performance, produced by "Friends," a group associated with St. Stephen's Church, will feature Christmas music. A blessing of animals at St. Stephen's Church grounds will take place at noon on Sunday, October 3, 2004. All Islanders are welcome to attend and bring their animals, large or small, to be blessed. This blessing is in conjunction with the Feast of St. Francis of Assisi, patron Saint of animals and the environment. "The annual affair is enjoyed by young and old alike." The St. Stephen's sixth grade religion class of Mary Ellen Maniszewski and Maura Rustowicz, and the eighth grade religion class of Mary Egloff and Maura Rustowicz had a food and clothing drive as part of a community service project. A truck was donated by Randy Mazurkiwicz of Residential Home Construction. The students collected clothing, books, toys, household items, and food from family, neighbors, and friends and donated them to St. Girard's Parish in Buffalo. It was a great success. Committee members shown from left are Fr. 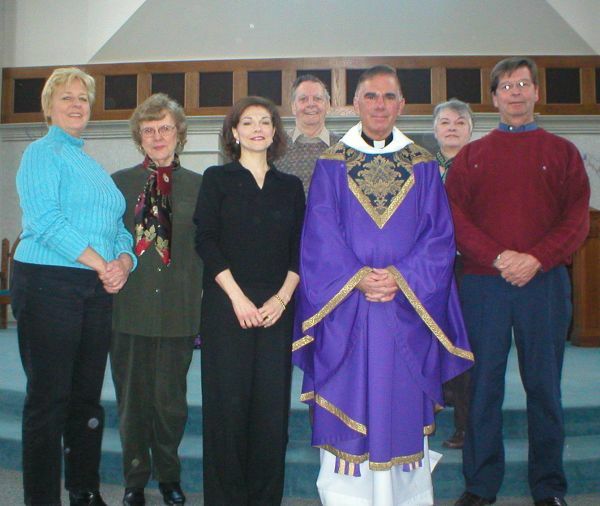 Daniel Fiebelkorn, Allison Armusewicz, Jo Ann Linenfelser, Dan Linenfelser, Don Merritt, Joan Ward, and Fr. Paul Nogaro. Joan Ward, director of pre-natal and infant nutrition for Catholic Charities, spoke at all the masses at St. Stephen's Church last weekend about the upcoming Catholic Charities Drive. The theme for this year's drive is "Help Spread A Ray Of Hope." Ms. Ward pointed out how important it is for people to have hope especially in times like these. According to Ms. Ward, last year Catholic Charities was able to give hope to over 100,000 people of all denominations in Western New York from 64 locations. She thanked the people of Grand Island for their past, generous support and encouraged those who could to increase their donations. The drive this year runs from March 28 - April 4 and the Diocesan goal is $10,500,000. Contributions can be made at weekend masses or by contacting the rectory at 773 7647. St. Stephen's Holy Name Society will host a Spaghetti Dinner from noon to 6 p.m. Sunday, October 26, 2003 in St. Stephen's School cafeteria, 2080 Baseline Road. The dinners will include meatballs, salad, bread, dessert, coffee or tea. Cost is $6/adults, $5/sr. citizens and $3/small portions for senior citizens and children 6-12. Children 5 and younger eat free. The dinner is for the benefit of the Holy Name Society scholarship fund and charities. Call 773-6459 for further information. An attractive, red marble columbarium has been built on the north side of the "Old St. Stephen's Church" on Baseline Road. Construction was completed in July 2003. These photos were taken Thursday afternoon and only begin to show what's taking place at St. Stephen's tomorrow and Saturday. 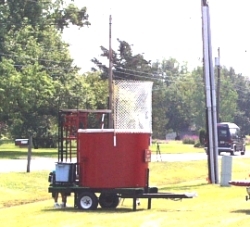 That's the dunk tank on the right! 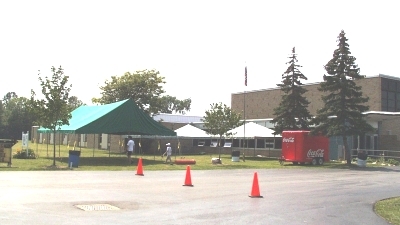 Those big tents over at St. Stephen's Church on Baseline Road are a sure sign that the Summerfest event is happening this weekend (August 15-16, 2003). The summer "picnic" has lots to offer including a Rock Climbing Wall on Friday and a KW Chicken Barbecue from 4-7 p.m. on Saturday. The beer tent and Vegas casino tent will be available both nights. Hours on Friday are from 5 p.m. to midnight and on Saturday - noon to midnight. Scroll down for a complete list of activities and be sure to get over to the church for a mighty good time - just like last year!! 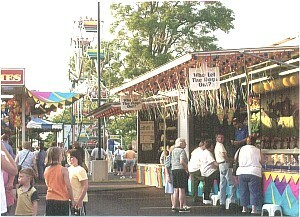 Summerfest at St. Stephen's Church on August 15-16, 2003 will have plenty of activities and food for the whole family. Among the spectacular inflatables and attractions to amuse young and old are an obstacle course, bungee run, sports cage, fun slide, bounce house (2), games galore, and a rock climbing wall. Summerfest hours are 5 p.m. to midnight on Friday and noon to midnight on Saturday. As a special feature on Friday evening, there will be Taz-Riffic Karaoke for children and teens. Taz-Riffic Karaoke will also be offered for adults later in the evening. Live music by Route 66 will play from 8 p.m. to midnight on Friday night, and the live band, “Joyride,” will be playing from 7:30 p.m. to 11:30 p.m. on Saturday night. The menu includes chicken chowder, Manhattan clam chowder, BW's chicken BBQ, Italian sausage, hot dogs, hamburgers, ice cream novelties, fried dough, and beverage stations. Watch for updates which will appear here as they become available. Scroll down to the next story for more information. St. Stephen's Church on Grand Island is planning its Summerfest for August 15-16, 2003. The event, which will run from 5 p.m. to midnight on Friday and noon to midnight on Saturday, promises to be better than ever. Pre-sale tickets for all events now available. Call 773-7647 to purchase tickets. Fr. Paul Nogaro, Don Merritt and Pat Collins. Sister Mary Anne Weldon, Director of Parish Based Social Services for Catholic Charities, spoke March 22-23, 2003 at all masses at St. Stephen's Church. Addressing this year's upcoming Catholic Charities Drive, themed "HOPE-Yours To Give", she pointed out the importance for people to have hope, especially in times like these. According to Sr. Mary Ann, last year Catholic Charities was able to give hope to over 100,000 people of all denominations in Western New York from 64 locations. Thanking the people of Grand Island for their past generous support, she also encouraged those who could, to increase their donation if possible because of the increased need now due to unemployment and other factors. This year's drive runs from April 6-13 2003 and the Diocesan goal is $10,250,000. Contributions may be made at weekend masses or by contacting the rectory at 773-7647. A Special Seminar - "The Catholic Christian Gift of Sexuality" for Students and Parents will be held 7 p.m. Monday, November 4, 2002 at St. Stephen Church, 2100 Baseline Road. The seminar will be presented by Bev Malona, RN, Natural Family Planning Office of the Diocese of Buffalo. All high school students and their parents are invited. An adult event at St. Stephen's on Friday, October 18, 2002 will feature a Theme Tray Raffle and Social. Doors open at 7 p.m. and raffles begin at 8:15 p.m. The 5th St. Stephen's Golf Challenge was successful in raising funds for the sponsorship of community opportunities. There were prizes for almost every competitor and several generous prizes were awarded to winners. The winning foursome included Mike Ludwig, Randy Gleave, Michael Jordan and Howard Zubin. The event started with a shotgun start (an 18-hole scramble) and concluded with a cocktail reception, banquet and awards ceremony in the River Oaks dining room. Karen Figler (left), Karen Conboy and Lou Panzica co-chaired the event. "Bring Back The Memories Of Neighbor Days"
Friday, June 28, 2002 will open the three-day St. Stephen's Church Lawn Fete. 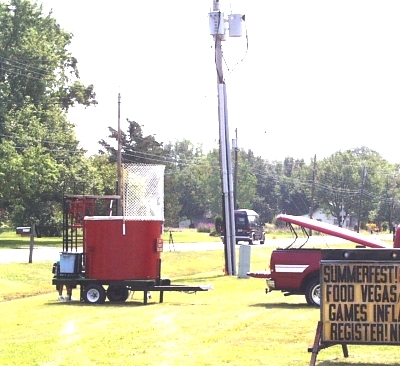 The trip back in time, when Grand Island hosted several summertime carnivals including St. Stephen's Neighbor Days, begins at 5 p.m. Friday. Hammerl Amusements will bring rides for kids and adults including the Giant Ferris Wheel, a Giant Slide and the Octopus ride. Game booths especially for children will be set up and tickets won may be turned in for a big selection of prizes. Games of chance will also be available for the adult crowd. It is recommended that those planning on attending the Olive Garden's Spaghetti Dinner from 2-6 p.m. Sunday, should take advantage of presale tickets for the full size dinner at $6.50 and the smaller dinner at $4.50. Tickets, if still available, will be slightly higher at the door. The best deal in town may be the presale amusement ride tickets, 10 tickets for $10, with each ticket worth one ride. Also to be offered is a bracelet special at $9 on Saturday from noon to 4 p.m. and Sunday from 1-5 p.m.
Line dance instruction and Country Line Dancing will take place Friday night, a Casino/Vegas Night and live music by "Joy Ride" will be featured on Saturday evening, and an 11 a.m. Polka Mass with music by "City Side" will be a "first" for Grand Island on Sunday. Raffles with top prizes of a "N.Y. City Red, White & Blue Get-A-Way for 2" and shopping sprees will be ongoing. The food and drink line-up includes hot dogs, hamburgers, sausage, Carvel ice cream, pop, beer tent, and cotton candy, of course. For a remembrance of St. Stephen's Lawn Fete, souvenir cups will be very reasonably priced. Click "Lawn Fete" and print out the entire three-day calendar of events. The Religious Education Department of the Buffalo Catholic Diocese will sponsor a family retreat for people with disabilities from 1-6 p.m. September 29, 2002 at St. Stephen's Church. To register or for information on three other retreats at various area parishes, call Sharon Urbaniak at 847-5514. The Retreat will include singing, storytelling, crafts, Mass and a meal. Admission is food to share at the dinner. (back) Mary Merritt, Don Merritt, George Minton, Dan Linenfelser and Fr. Dan Fiebelkorn. Parishioners of St. Stephen's Church kicked off their part in the annual Catholic Charities Drive Sunday, March 3, 2002 when Ms. Kathy Pharris, director of Adult and Children's Day Services for Catholic Charities, spoke at all masses. Thanking the people of St. Stephen's for their past support, she said that over 130,000 people in the eight counties of Western New York were assisted last year by Catholic Charities, 98 of them from Grand Island. The goal of this year's drive, running from March 17-March 24 and themed "Be a hero, give hope," is 10 million dollars. Contributions may be made after weekend masses or by contacting St. Stephen's rectory, 773-7647. Shown are St. Stephen's Lenten Fish Fry co-chairmen Patty Avery, Karen Conboy and Rosanne Panzica. Stephen School and Church staged the first of the season Lenten Fish Fry Dinners Friday, February 15, 2002 in the Cafeteria at St. Stephens School. Sit-down service and take-out are available from 4-7 p.m. every Friday during Lent. The menu includes fried or baked haddock,shrimp or scallops, potato salad or French fries and cold slaw, or macaroni and cheese dinners. Home made desserts are available. Students from the 8th grade confirmation class help with the bussing of table and parent volunteers serve the dinners. Patty Avery, Karen Conboy and Rosanne Panzica are co-chairing the event. St. Stephen's RC Church will host the internationally known Miami of Ohio University Men's Glee Club 7:30 p.m. January 4, 2002 at the church, 2100 Baseline Road. There is no admission. The Glee Club, founded in 1907, will present a full concert of many different styles of music, both sacred and secular, including Renaissance, Classical, 20th Century, Pop, Spirituals, and a variety of World Music. The Club is among the oldest and largest groups of its kind and has toured around the world, singing at such landmarks as the National Cathedral and the Kennedy Center for the Performing Arts, and was recently commissioned by the French government to host an international choral festival in the Caribbean. The chorus is known across the nation and beyond for its tradition of music excellence, and on Friday, January 4th they'll be singing here on Grand Island! St. Stephen's annual chicken dinner is set for Sunday, October 14, 2001 from noon to 5 p.m. The event will offer a bazaar and auction. Dinner prices are $6 pre-sale and $7 at the door for 1/2 chicken dinner with potato salad, tossed salad, roll & butter, hot beverage or iced tea and pie. Tickets for a 1/4 children's chicken dinner (same menu) are $4 pre-sale and $5 at the door. The event takes place at the church, 2100 Baseline Road. All members of the community, from children to senior citizens are invited to an Hour Of Power at St. Stephen's "Old" Church, 2100 Baseline Road from 7:30-8:30 p.m. October 3, 2001. 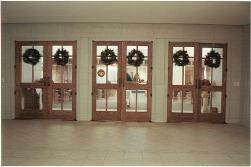 St. Stephen's Catholic Church will be open until 10 p.m. this evening (Wed., Sept. 12, 2001) for prayer and reflection. Daily Mass at 7:30 and 12:05 will be offered for the victims and their families. A program to help all who desire healing or wish to help those who are bereaved will be offered on Thursday, September 13, 2001 at 7 p.m. in the Hospitality Room of St. Stephen's New Church. Presentations will be given by Joanne Moscati, a retired psychiatrist nurse and pastoral minister trained in Grief Counseling, and Beryl Kinney, experienced in helping many in the area of a loss, whether it be through illness, accident, suicide, or natural circumstances. Refreshments will be served after the presentations and then an opportunity given for a time of reflection and sharing in small groups. A short prayer service will close the evening. All are welcome. The Christian Foundation for the Performing Arts will hold a Spring Concert 7:00 p.m. Friday, May 11, 2001 at St. Stephen's Catholic Church. The concert features the music of the Festival Chorus with special appearances by Joyful Noise, a gospel barbershop quartet, and soloist Nan Heckler. A free offering will be taken. St. Stephen's Church Catholic Charities Drive committee members are (standing left) Rev. Dan Fiebelkorn, George Minton, Rev. Paul Nogaro, Dan Linenfelser, Ted Korkuc and Harold Barth; and (front left) Eileen Wylegala and Eileen Minton. The Annual Catholic Charities Drive will get under way at St. Stephen's Church Sunday, April 1, 2001 and will run through Sunday, April 8. The Rev. James Croglio, therapist at The Counseling Center For Clergy & Religious, spoke at all the masses at St. Stephen's Church last weekend about the upcoming Drive, this year themed "Hope Grows With Your Help." Fr. Croglio thanked the people of Grand Island for their past generous support and said that last year over 130,000 families of all denomnations were assisted by Catholic Charities in Western New York. Contributions may be made at Sunday masses or by contacting the rectory at 773-7647. Parishioners of St. Stephen's will again offer their delicious Lenten Fish Fries from 5-7 p.m. each Friday through April 6. Senior citizens are offered an early bird admission at 4:30 p.m. and their dinners will be discounted. Take-out is available by calling 773-4347. St. Stephen's Altar Society completely decorated the new St. Stephen's Roman Catholic Church on Baseline Road for the Christmas season. Photographer Barbi Lare gives a good view of much of the beautiful new church.